Summerville Cemetery and Mausoleum (also known as Parks Cemetery) is located on Highway 17A South (also Boone Hill Road) in Summerville, South Carolina, right beside Parks Field. Founded in 1941, many generations of Lowcountry families are laid to rest nestled among rows of beautiful dogwoods, majestic live oaks, and colorful crepe myrtles. Unlike many cemeteries, both upright and flat memorial markers are allowed. 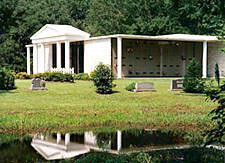 Summerville Cemetery Mausoleum was established in 1984 and offers outside and inside tandems, crypts and niches, as well as a spacious chapel that can be used for funeral or memorial services. Entombment in the mausoleum offers an affordable alternative to ground burial. With the purchase of a mausoleum crypt, the need for an outer burial container or vault is eliminated as well as a monument. 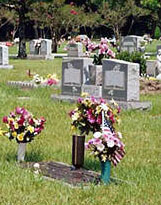 The cemetery grounds are owned and maintained by Parks Funeral Home. Please contact our office for any of your cemetery, mausoleum or monument needs. As a service to our families, Parks Funeral Home can design, order, and install markers in any or material that you choose. We can help you customize your own marker or duplicate an existing marker. Markers can vary in size and material, with a diverse price range. 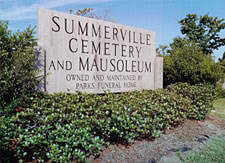 We can assist you with a marker to be placed in Summerville Cemetery or any other local cemetery. We also offer monument cleaning services as well. Please contact our office for any of your monument needs. For those families that purchase a monument from an outside monument company, contact our office before placing an order for any monument being placed in Summerville Cemetery. The necessary paperwork will be sent to the monument company to ensure that the monument will fit in the designated cemetery space. A representative from Parks Funeral Home will be present during installation of the monument to ensure alignment and proper placement as well. The monument company is also responsible for the alignment and survey fee at the time of installation. For more than 48 years, Parks Funeral Home has been a proud sponsor of Parks Field Dixie Youth Baseball, a non-profit organization. Parks Field has provided our area's youth with many years of safe and enjoyable recreation facilities.